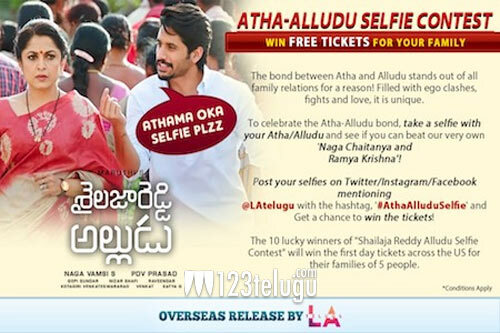 Atha – Alludu Selfie Contest – Win Free Tickets for Your Family. Embrace the chemistry between Atha and Alludu, this Vinayaka Chavithi – LA Telugu is excited to bring you the Atha Alludu Selfie Contest. With 10 lucky winners, this contest will avail you the first day tickets for the latest Shailaja Reddy Alludu movie, premiering on 12th September 2018 across the United States. The bond between Atha and Alludu stands out of all the family relations for a reason! Filled with ego clashes, fights and love, it is unique. To celebrate this Atha-Alludu bond, take a selfie with your Atha/Alludu and see if you can beat our very own Naga Chaitanya and Ramya Krishna! Entries should contain the selfie of Atha & Alludu of a family. Post your selfies on Instagram/Twitter/Facebook mentioning @latelugu with the hashtag, ‘#AthaAlluduSelfie’. Out of all, 10 lucky winners of ‘Shailaja Reddy Alludu Selfie Contest’ will win the first day tickets across the US for their families limited to 5 people. Not only will we love to see all your selfies, but we will also post a few best of them on our profiles. Get a chance to win the free family tickets now!